PAMELA FROMAN WON THE 2008 TOWN & COUNTRY COUTURE DESIGN AWARD FOR BEST IN GOLD!!! Thank you to everyone who voted for Pamela in the online primaries!! 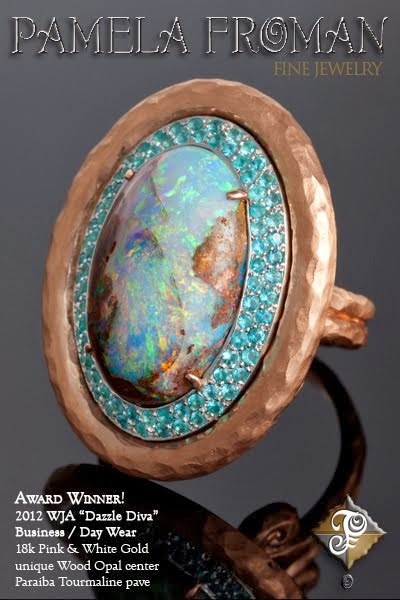 As you know, your votes helped her to become a Finalist in the prestigious Town & Country Couture Design Awards, often referred to as the "Oscars of fine jewelry design." 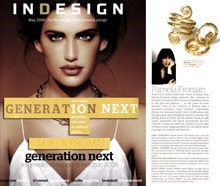 The Gold Category was arguably the most difficult category to compete in, with over 30 entrants, most of them very well-known, established design companies. 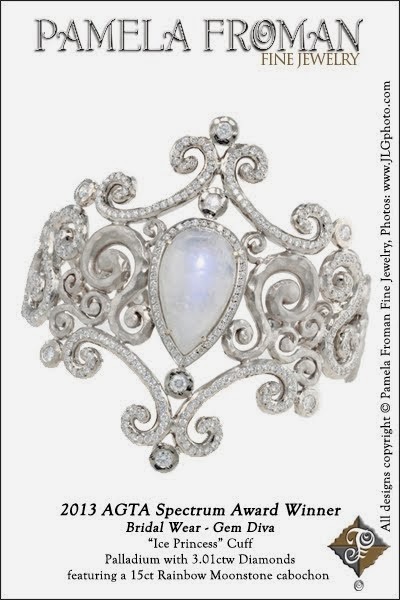 The final voting was done by fine jewelry retailers and fellow jewelry designers at the Couture Show in Las Vegas, and the top three in each category were invited to an exclusive awards ceremony/cocktail party at the Wynn's club Blush. 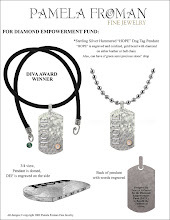 At the party, the names of the top three in the Gold Category were announced: "H. Stern... Calgaro... Pamela Froman Fine Jewelry... and the winner is... by popular demand... Pamela Froman!!" The crowd went wild as Pamela was led to the stage to accept her award and take photographs with the editor of Town & Country Magazine and a model wearing her piece! It was all so exciting!!! P.S. - I had my camera with me and plan to post some snapshots I took at the event, so check back in a few days. First of all I want to thank all of you who voted for me in the "Town & Country Couture Design Awards". It worked I am a finalist, YEAH! 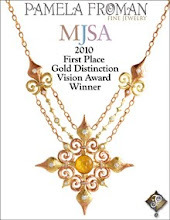 So now they display my necklace in a vitrine at the show and the buyers vote at the show for the winner. I am very excited. It has been a crazy couple of weeks getting ready for the Couture Show in Vegas. Jilienne and I don't know if we are coming or going. I did not get a chance to use some of my amazing stones I got in Tucson but, I have some cool new pieces debuting at the show. 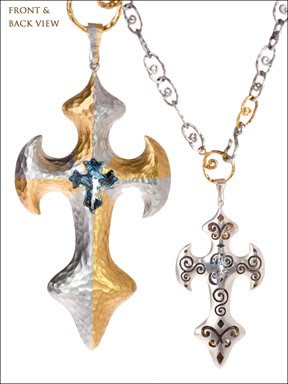 Some one of a kind pieces that are beautiful. Also, I just finished designing the poster for the back of the booth at Couture, it is 78 wide and 45 high. It is above, I think it will look great at the show, plus it has my best creation in it, a photo of my son Hudson Elijah in the locket. We leave Tuesday and the show is 6 days, so it is long. I will write when I get back. Have a great weekend! One-of-a-Kind 18k Yellow Crushed Gold with Malaya Garnet, Diamonds, and Rutilated Quartz; Dangles are removable so Studs can be worn alone. 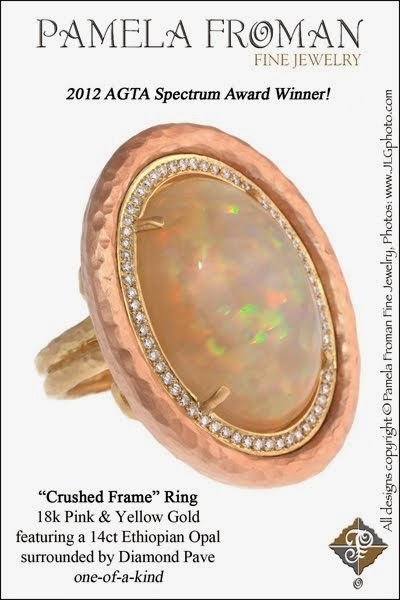 "Is there anything more versatile than the stack ring? 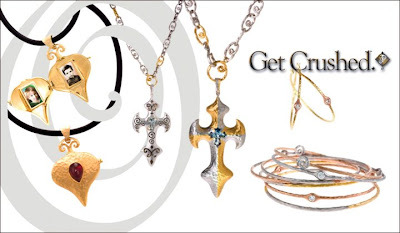 These brilliant bands can be wedding rings, eternity bands, or the finger version of the charm bracelet, ready to be mixed or matched to suit a woman's style. 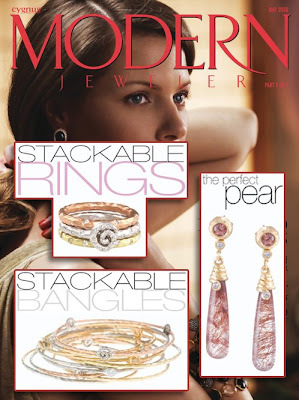 Each stackable ring encircles all these possibilities. 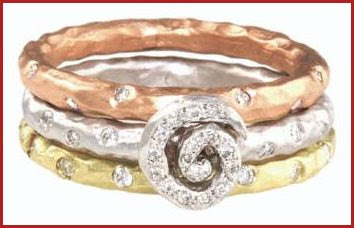 ... Two can accompany a wedding ring, three's charming, and with four definitely more is more." 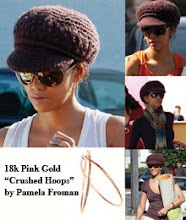 Couture Design Awards: Vote for Pamela! 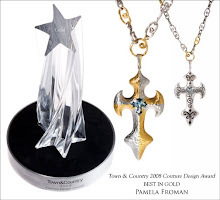 Pamela Froman has entered her one-of-a-kind "Gothic Harlequin Cross" (see above) in the Gold Category of the annual Town & Country Couture Design Awards. This year, the Awards tap the power of the Internet and get you directly involved in who gets to display their designs at Couture. This round of "primary" voting will be done online to determine the finalists in each of the twelve categories. 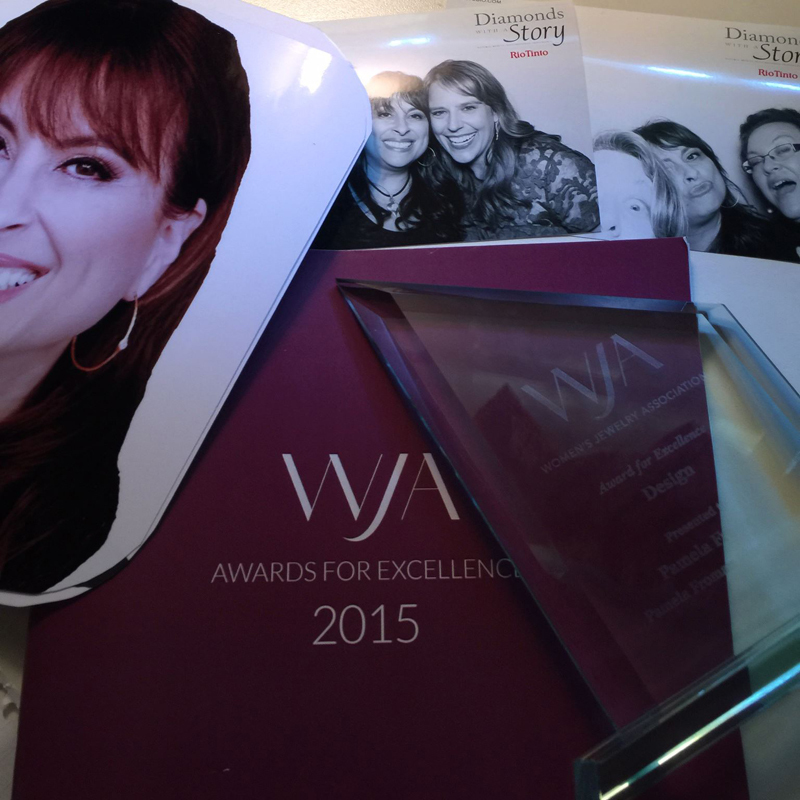 We would absolutely love it if you took a moment to cast your vote for Pamela! The top finalists in each category will have their products displayed at Couture 2008, May 27th to June 2nd at the Wynn Las Vegas, and Couture attendees will vote from among the finalists on site to determine final winners for each category. 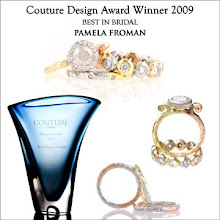 So, if you love jewelry and want to see the industry's most creative and innovative work, go to http://www.couturedesignawards.com to cast your vote. 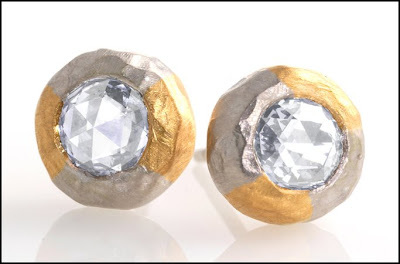 These "Harlequin Stud" earrings are 22k Gold and 18k White Gold with Rose-Cut Diamonds. ATTENTION ALL ARTISTS! This Affects You!! There is currently a proposed bill before Congress called the Orphan Works Act. This proposal, if passed, will essentially void all of your intellectual property copyrights! If you are a visual artist that relies on copyright laws to protect your work, you should be aware of this issue. Visit http://www.illustratorspartnership.org to further research this bill. You can also listen to an mp3 of an interview recorded Saturday April 5, 2008, where artist and producer Mark Simon discusses this issue with Brad Holland of the Illustrator's Partnership: http://www.sellyourtvconceptnow.com/orphan.html. Mr. Holland and Mr. Simon have given their permission for this audio file to be copied and transferred and replayed, so feel free to forward this information to all of your friends. If you'd like updates on what's going on with this bill, you can get on the Illustrator's Partnership e-mail list by sending a request to illustratorspartnership@cnymail.com. Lobbyists are trying to push this bill through before the creative community realizes what's going on, so please read up on this and spread the word to every creative person and group you know! A quick lesson about the Mohs Hardness Scale.